Technology is driving a massive change in the way we work. IDC, the international IT market intelligence firm, expects the number of mobile workers globally to reach 1.3 billion – 37% of the global workforce – by 2015. In this country, 93% of employees say they now spend at least some time working away from the office. This shift from the traditional 9am – 5pm office working environment represents a huge challenge for employers who have a duty of care to protect all of their workers wherever they are located. But it also offers a challenge to employees whose work-life balance is under ever increasing pressure – finding the right work life balance seems to be a struggle for most. This week is National Work Life Week, it aims to help both employers and employees focus on the importance of maintaining a healthy balance between work and home life. It’s an initiative that we should all try to embrace - an employee who has found the right work life balance is likely to be a happy and productive employee. 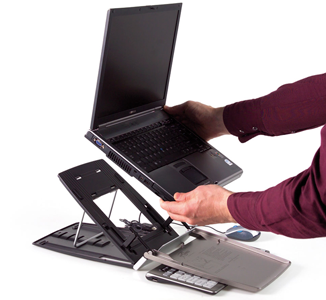 As part of that, we are offering all our customers a 25% discount on some of our special Homeworker Laptop bundles – exceptional ergonomic products designed to make life easier and more comfortable for the ever-growing army of people who work from home or on the move. As well as making sure that your remote workers have the necessary equipment to enable them to work safely and securely, you will also need to check that their working environment is up to scratch. The Health & Safety at Work Act draws no distinction between office-based staff and those who work at home or remotely, so as well as running a full DSE assessment, it may also be necessary to PAT test electrical appliances, check on dimensions of working area, lighting levels and so on. Our nationwide team of experienced DSE Assessors have considerable expertise and skills in different working methods and practices and will make sure that you meet all your legal obligations. To find out more, call us on 0845 345 0010, email [email protected] or speak to your local account manager.